Practical Session: Using Accelerators to Improve Performance. Presentation of SC-Camp and the Sponsors and the local research teams. An introduction to the first parallel and distributed machines until today state-of-the-art. This lecture aims at presenting the key factors from the rise of parallel applications to today’s huge distributed systems. From the cluster to BigData, passing through the grid, the cloud, GPU, and much more. Computer simulation and data processing is now a key skill for every engineer as the complexity of the problems to be solved and the amount of data to analyzed are always increasing. High Performance Computing (HPC) proposes to leverage distributed and parallel computers to execute these applications quickly and efficiently. 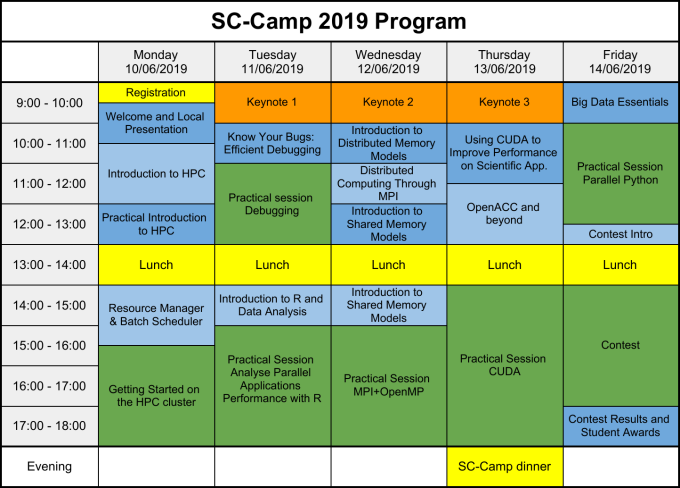 This talk gives an overview of the HPC concepts, then, a typical HPC workflow is studied and precious advice to get your HPC simulations running efficiently are provided. High Performance Computing platforms are platforms offering a large number of computing resources shared among a large of number of users. The Resource Manager and Job Scheduler are the core tools of such platform which allow to distribute the resource to the users and avoid any conflict. This lecture proposes an overview of a typical HPC platform and defines the concept of resources. It describes and explains the role of the resource manager and job scheduler in an HPC platform, and introduce the concept of job scheduling. Then it offers an overview of the most useful features: interactive session, reservation, job submission, etc. in the main job schedulers (e.g. SLURM). In the end, it provides all the key elements for an efficient HPC workflow. The first purpose of the this session is to allow the students to configure their access to the HPC platform. In a second time, the students can experiment with the main features of the job scheduler. This presentation gives the essentials to fight and prevent the bug invasion occurring in any software. It proposes a short introduction to debugging tools, focusing mainly on GDB and Valgrind. Then the most common types of bugs are presented and explained, and a method to track them is proposed. Finally, recommendations for day-to-day software development are advised in order to keep safe from bugs (as much as possible) or at least track them efficiently. During this practical session, the student will learn how to track bugs in voluntarily infested programs using the tools introduced previously. This lecture proposes a quick introduction to R and data analysis. It gives an overview of the basic commands and data structures to get started with R and suggests a few good practices to organize and manipulate data. With a good basis, let’s practice on the subject of performance evaluation of parallel applications. Programming models to understand the trends when using multiple computing units. The challenges of distributed computing involve exchanging message. The MPI, message passing interface, is still THE standard for many distributed applications. Throughout this lecture we will visit many aspects of distributed programing usign MPI. Todays’ HPC systems always count on multiple cores. With the goal to improve the usage on such systems knowledge of multithread programing is mandatory. This lectures shows the basis of OpenMP : a well spred environment to implement parallel applications. Modern HPC platforms platforms are based on both Distributed and Shared memory architectures. In the case of Shared Memory, even handheld devices uses multiple processors/cores hardware, and it is usual to have up to 16 processing cores on commercial smartphones. Understanding how these architectures works is very important for Computer Scientists and programmers. In this tutorial, students will learn about some different Shared Memory models, the advantages of this approach, and the main implementations found for commercial and scientific usage. Using MPI and OpenMP, we will guide you on the implementation of a parallel and distributed application. Programming with CUDA we will visit projects that significantly improve their performance using CUDA. This practical session is the opportunity to use accelerators that will be available for the students. A contest will be proposed to the student to allow them to apply the knowledge they acquired. Different problems are provided and they can selected one/many categories in which they which to participate. The students are encouraged to propose parallel and distributed solutions that run on the HPC cluster. Results are evaluated based on their correctness and performance. The students are given time to solve the problems and are supervised by the instructors of the SC-Camp. The best solutions of the contest are presented by the students and discussed with everybody.